Wear this pair of derby shoes brought to you by Tresmode to make a style statement. It has an ethylene vinyl acetate outer sole that offers a better grip. Moreover, the upper part has been made of leather, which ensures easy maintenance, while the lace up fastening ensures a proper fit. 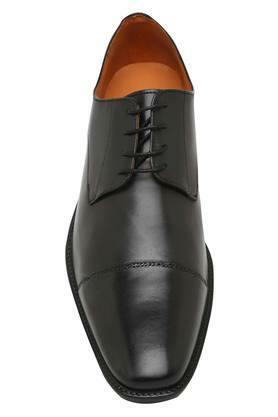 Get admired for your style sense by wearing this pair of derby shoes along with any of your formal outfits. Crafted from fine quality leather, it is easy to maintain.